Is The Relic Guild part of a series? Yes – one story chopped up into three books. One of my writing heroes is Tad Williams. I’m a huge fan of his sprawling fantasies like Memory, Thorn and Sorrow and Otherland, and how one book leads to another as though you’ve simply turned to the next chapter. I’ve always wanted to tell a story in this way, and The Relic Guild was the first idea I had that naturally accommodated it. To be vague, I can draw inspiration from pretty much anything around me. With regards to The Relic Guild, I think there has been a long and slow build up to writing it. Everything that has ever sparked my imagination since childhood – the novels and comics I read, the movies and TV shows I watched, the RPGs I played – has inspired the book in some way. It’s very much a product of where I’ve come from. Watching Harryhausen movies on TV was probably my earliest experience. Dr Who – always, always Dr Who. I remember reading Elizabeth Boyer books, and the Narnia stories. And, of course, I’m old enough to be part of the Star Wars generation. That film was enough to inspire anyone’s imagination. I suppose I just stumbled upon sci-fi and fantasy at a young age, and instantly fell in love. I adore writing, telling stories, and I can’t imagine that I’ll ever stop. Although I’m only at the beginning, working in the industry has been great so far. Other authors, for the most part, have been kind and encouraging. My editor, along with the whole team at Gollancz, really have been as welcoming and supportive as I could’ve hope for. I should also mention my agent, who delivered me to a place that I never would’ve reached by myself. Research practices? Well, research, for me, usually lasts until my imagination starts taking over. As for working/writing practices, I like to get up early and start the day as I mean to go on. I do work at nights, too, but undoubtedly my best writing comes out during the day. I look back on it with a touch of confusion, actually. I honestly believe that I was a writer before I realised what I was doing. There are a few instances of this that spring to mind, both happening at school. When I was eight or nine, the students had to write a Christmas Carol for a school competition. My carol won, and I had to read it to the entire school during assembly. And then, when I was around the same age, I wrote a short story which I had to read at some inter-school event where teachers were showing off what their pupils had achieved. Later, when I was around thirteen or fourteen, I remember my English teacher telling me that I had a talent for writing, and that I should take it more seriously. Of course, I didn’t listen; I bloody hated school, and the teachers. At the time, I just saw these events as what I did at school on those days. Looking back, I think things were starting to happen inside me, and I was too clueless to realise what it was. Catching on late has been a reoccurring theme in my life. I honestly think that fantasy especially is stronger than ever, with movies and TV being a big help to get the genre recognised and accepted by a broader audience. Feels like a good time to be a fantasy writer. I think The Relic Guild will fit in well generally, though I couldn’t, for the life of me, tell you which sub-genre of fantasy it belongs to. It’s full of mystery and adventure, magic and monsters – it was written a piece of entertainment. Let’s just call it fantasy. I have a few half-done short stories lurking on the computer, along with a couple of standalone novels – always a story waiting to be finished! But the truth is, for the past couple of years I’ve done nothing but write The Relic Guild and its sequels, and that will continue through the next year or so. Because of the way I’ve broken the story into two timelines, forty years apart, with one timeline driving the other, it has proved to be hideously complicated at times. Either timeline wouldn’t stand up on its own, but together they intertwine into a single story. I find that I end up writing smaller amounts than I usually would in a single sitting, and they’re quite intense sessions as I always have to wonder what kind of impact the info and details are going to have on the past or the future. I’m sure other writers would find it a breeze, but for me I have to tread carefully and slowly, and it takes up most of my writing time. 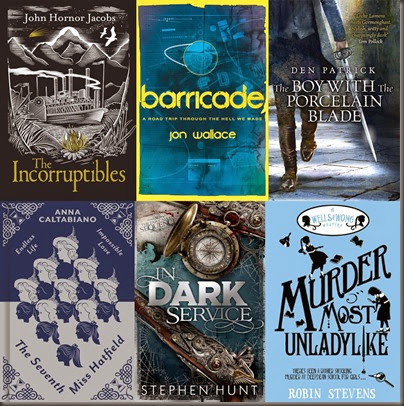 I’ve spent the last few months reading my fellow Gollancz debuts – John Horner Jacobs, Jon Wallace, Den Patrick, Anna Caltabiano, Stephen Hunt – and collectively they’ll make a very hard act to follow when The Relic Guild comes out in September. But for my current read, I fancied a break from fantasy and sci-fi, so I picked up Murder Most Unladylike by Robin Stevens. So far it is ridiculously good fun. I used to be a dancer, and I can bend my arms back to very strange angles. Oddly, the beginning and the end of this story. I’m currently writing the third book of The Relic Guild, but the first book isn’t out for another two months. There’s been a lot of waiting, some anxiety and excitement along the way, I have no idea what happens next, but I’m looking forward to finding out. I can’t wait for the conventions and festivals and parties that are taking place over the next couple of months; it all feels like a giant countdown to the release of The Relic Guild. 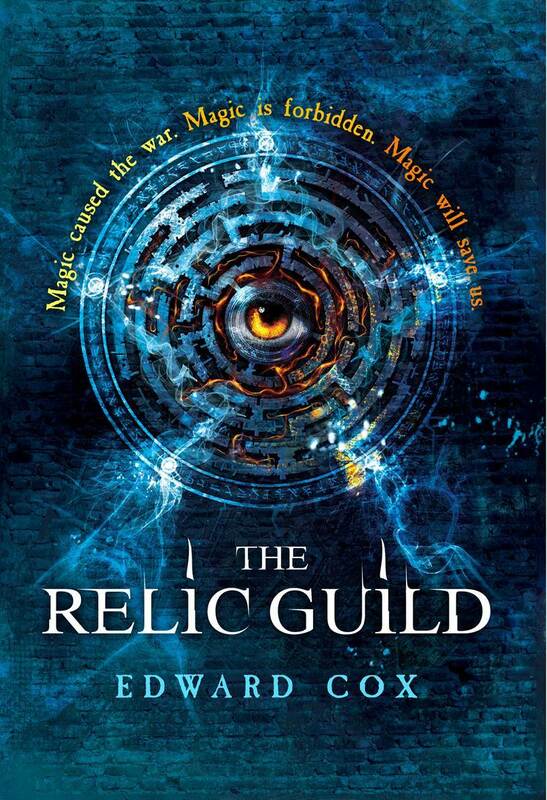 The Relic Guild will be published in the UK by Gollancz on September 18th, 2014. No news yet on overseas release. 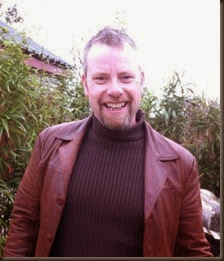 For more on Edward Cox’s writing and shenanigans, be sure to follow him on Twitter and Tumblr. He’s a wonderfully chirpy and friendly fellow.